WALLOPS ISLAND, Va. -- NASA's new moon mission, designed to survey the little-known lunar atmosphere, will blast off from Virginia on Friday aboard a U.S. Air Force Minotaur 5 rocket assembled from stockpiled Peacekeeper missile motors originally built to hurl nuclear weapons at targets across the globe. The Minotaur 5 rocket, standing 80 feet tall, is making its first flight Friday, but the five-stage launcher leans heavily on proven technology used on previous rockets which have successfully launched 23 times since 2000. 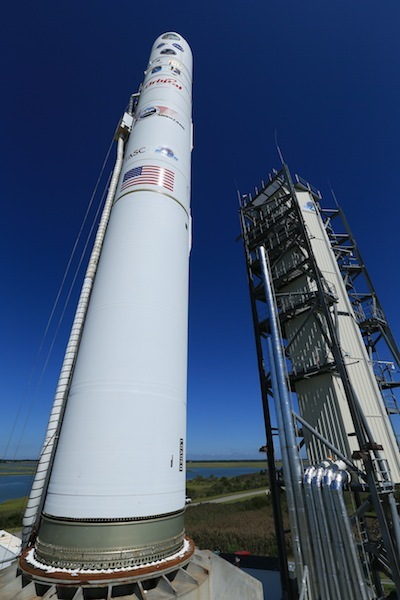 Conceived as a relatively inexpensive answer to rising launch costs facing U.S. military space programs, the Minotaur rocket family was developed by Orbital Sciences Corp. under contract with the Air Force. Three versions - the Minotaur 1, Minotaur 4 and Minotaur 5 - are capable of launching small satellites. Other Minotaur configurations have launched on suborbital missions in support of missile defense testing. "This is a dream come true for me," said Lou Amorosi, director of the Minotaur program at Orbital Sciences. "I have always wanted to help launch something to the moon. In fact, when we started looking at designing the Minotaur 5 about 10 years ago, we tried to find the right mix of rocket stages to enable a lunar mission." The Lunar Atmosphere and Dust Environment Explorer, or LADEE, stands 7.7 feet tall, stretches 4.7 feet in diameter and weighs 844 pounds, easily fitting inside the Minotaur 5's 92-inch diameter composite payload fairing. Orbital Sciences won the LADEE launch contract in 2009 through an arrangement with the Air Force, which oversees the Minotaur program. Orbital acts as the Minotaur prime contractor and operator. NASA's policy is to seek commercial launch opportunities for its science missions, but agency officials said there was no commercial launch option at the time. Smaller rockets, such as Orbital's Pegasus and Taurus vehicles, were not large enough to do the job. More powerful launchers, such as the United Launch Alliance Atlas 5 rocket, would have been overkill. Faced with that dilemma, NASA approached the Air Force to secure a launch aboard a Minotaur 5 rocket. Virginia was selected as the launch site because it already has Minotaur launch facilities in place, Amorosi said. According to Amorosi, the LADEE launch contract is worth $55 million, including development of the new Minotaur 5 upper stage. The launch of LADEE is the first Minotaur 5 mission to lift off from the Mid-Atlantic Regional Spaceport, a complex leased and operated by the Virginia Commercial Space Flight Authority on property owned by NASA's Wallops Flight Facility on Virginia's Eastern Shore. Situated on a barrier island just a stone's throw from the beach, launch pad 0B has hosted four Minotaur 1 launches since 2006. 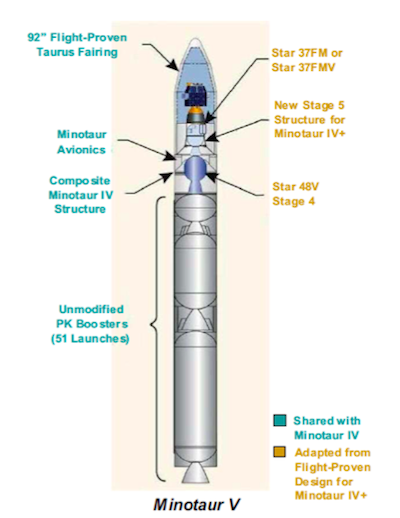 But the Minotaur 5's Peacekeeper first stage is nearly 7.7 feet in diameter, larger than the Minotaur 1's first stage, which comes from a decommissioned Minuteman missile. Amorosi said technicians replaced work platforms inside the launch pad's mobile service gantry to accommodate the larger diameter rocket, and the structure's height was extended to 127 feet tall to support the bigger Minotaur 5 booster. The Minotaur 5's three lower stages, all taken from the military's Peacekeeper stockpile, are identical to the motors flown on five previous Minotaur 4 missions. 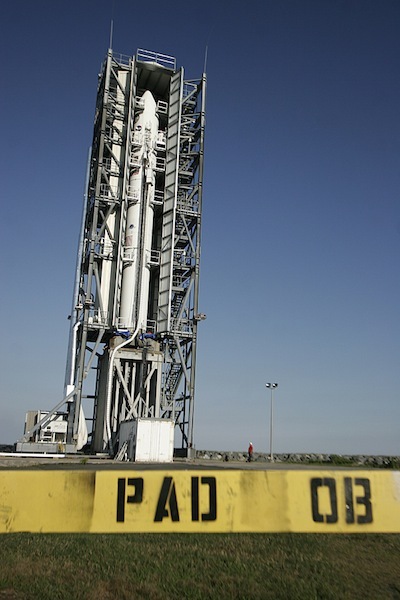 The most recent Minotaur 4 launch in 2011 also used the same Star 48 fourth stage motor as the Minotaur 5. The Minotaur 5 employs an extra fifth stage to boost payloads into higher orbits. The SR118 first stage motor, originally built by ATK, fires for approximately 57 seconds and produces about 500,000 pounds of thrust. The SR119 second stage, originally built by Aerojet Rocketdyne, fires for about 78 seconds. The Hercules SR120 third stage, the last of the three Peacekeeper motors to fire, burns for for 72 seconds. The ATK Star 48BV fourth stage, a commercial motor used on previous Minotaur, Delta 2 and space shuttle missions, burns for 85 seconds. The ATK Star 37FM fifth stage, similar to a flight-proven satellite kick motor, flies on a Minotaur 5 rocket for the first time, firing for 63 seconds. The fifth stage is spin-stabilized, using tiny thrusters to spin up the rocket before ignition and yo-yo-like weights to slow down the spin before spacecraft separation. See our launch timeline for more details on the Minotaur 5's flight.